What is AVCHD and how do you convert AVCHD files? What is AVCHD? The AVCHD video format is commonly used for storing HD video on today’s digital cameras. It uses the MPEG-4 AVC / H.264 codec for video compression, which results in great video quality and a relatively small file size. However, the AVCHD format is not recognized by most mobile devices. To watch an AVCHD video on a mobile device, you need to convert your video to a more device-friendly format like MP4. In the guide below, we will compare AVCHD and MP4, and cover two ways of converting AVCHD files to MP4. The first option to convert AVCHD videos is to use file conversion software. 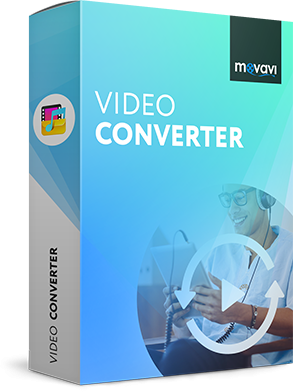 We recommend you try Movavi Video Converter – a fast and reliable program that supports more than 180 media formats and lets you convert video, audio and even image files. It will help you to convert AVCHD to MP4 quickly, thanks to the ultimate SuperSpeed technology. Plus, if you have a video in a different format (AVI, MKV, MOV, FLV, etc.) 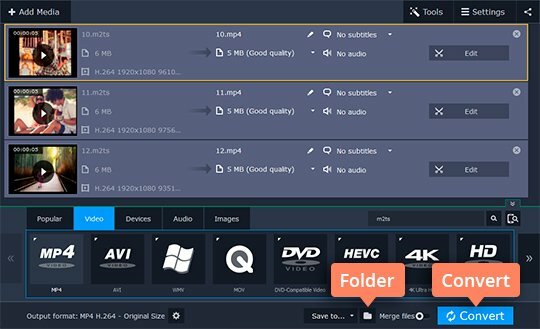 that’s been compressed with the H.264 codec, the decoder will help you transfer the video stream to the MP4 container without re-compression (convert H.264 to MP4). The program can also help you change the video codec for your MP4 video from MPEG-4 to H.264 (convert MP4 to H.264). 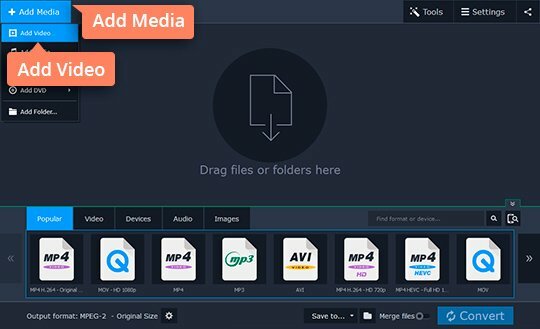 To learn how to convert AVCHD to MP4 without quality loss, download Movavi Video Converter for Windows or Mac and follow the simple guide below. Open the downloaded installation file and follow the instructions on your computer screen to install the video encoder software. First, connect the AVCHD camera to your computer. Click the Add Media button and select Add Video. Now open the folder containing the files you want to convert, and add those files to the program. Open the Video tab, click the MP4 category, and choose the desired preset from the list. To create an MP4 video for a specific mobile device, open the Devices tab and select the preset for the target device. By default, the converted files will be saved to the Movavi Library folder. You can continue with this folder or choose a different one by clicking the Folder icon. Now all the required settings have been specified, so you can start converting your files. Click Convert to launch the conversion from AVCHD to MP4; on completion, the folder containing the converted videos will open automatically. Another option to convert AVCHD files to MP4 is to use an online conversion tool. 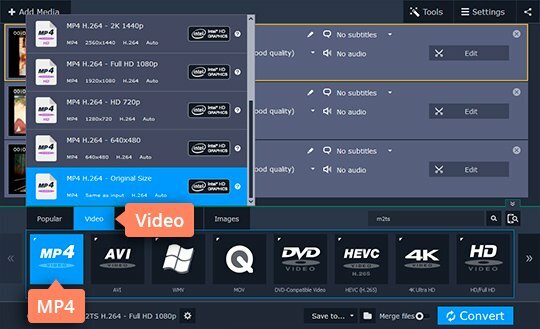 If you don’t want to install any additional software on your computer, you can try using the online video converter at videoconverter.com. First, open the website. Then click Add Your Files in the upper left corner of the screen, choose the file you want to convert, and hit the Convert button. After the conversion is complete, click the Download button to save the file on your computer. Note that you can only convert one file at a time, and the file must be no larger than 100 MB.